Green Mountain Conservation Camp instructors take part in aquatic ecology training at Buck Lake the week before the first campers arrive. When there are no campers at the waterfront, Buck Lake is a quiet place. These signs spell out a week's worth of activities at the Green Mountain Conservation Camp. There is a public boat launch at Buck Lake, but motor boats are not allowed and the beach is reserved for camp only. Green Mountain Conservation Camps are weeklong sleep-away camps run by Vermont’s Fish and Wildlife Department. Camp sessions are held throughout the summer at Buck Lake, in Woodbury, and Lake Bomoseen, in Castleton. Bomoseen is a popular recreational destination in the Rutland area. Its shores are peppered with summer homes and campgrounds. There’s golfing and dining, and lots of boating. Buck, on the other hand, isn’t home to much more than the camp, according to Vermont Fish and Wildlife Education Manager Ali Thomas. A keep-away game between campers and staff is a popular waterfront pastime at Buck Lake. "Buck Lake is a 39-acre lake that is essentially pristine," she said. "If you look around it there’s … little to no development at all. Our little waterfront is kind of a development, and then there’s a tiny sliver across the lake that is a different landowner other than the state. But it’s been left pristine. It’s a wetland, so you can’t really build on it." That makes it a special place for campers like 12-year-old Jaden Szurley, from Jefferson, New Hampshire. He likes a lot of things about camp, but especially the lake. "What I like about it is I like seeing the nature and shooting the .22s and the bows and the swimming!" he said. "Swimming is awesome. It’s nice for getting fresh again. Like, if you’re like hot, just getting in – it cools you down automatically, and it’s fun." 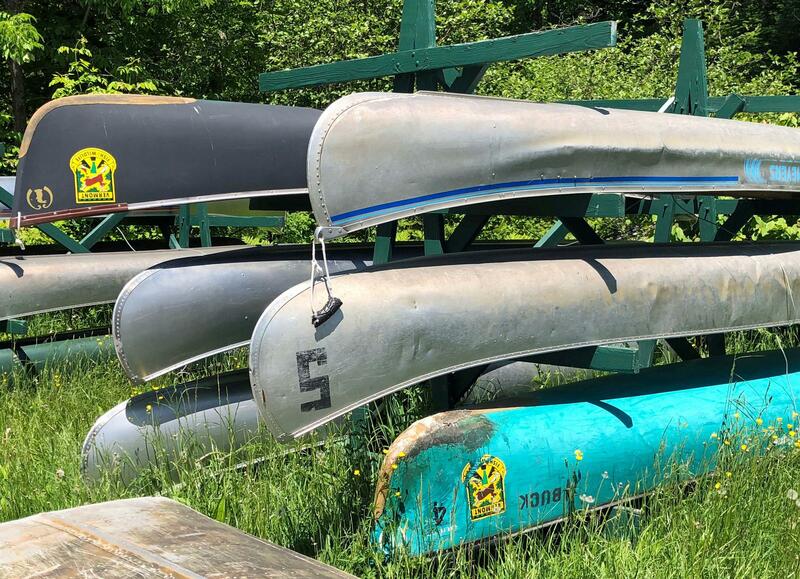 The Green Mountain Conservation Camp has a collection of canoes for campers to try. In addition to swimming, the waterfront is where canoeing, fishing and aquatic ecology classes happen at camp. At the end of class, students pull on waders and tall mud boots. They wander the shoreline and abutting wetland with buckets and nets, in search of resident crayfish, salamanders, frogs and fish. 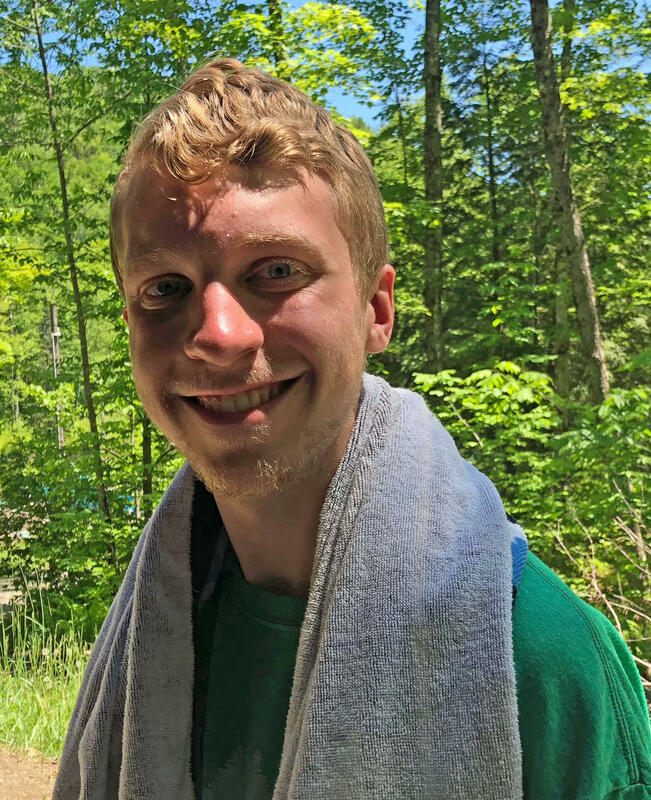 Joe Franckiewicz, a natural resource instructor at Kehoe, the Green Mountain Conservation Camp at Lake Bomoseen, calls his job "the best gig in the world." Before camps started this summer, he and other instructors trained at Buck Lake. 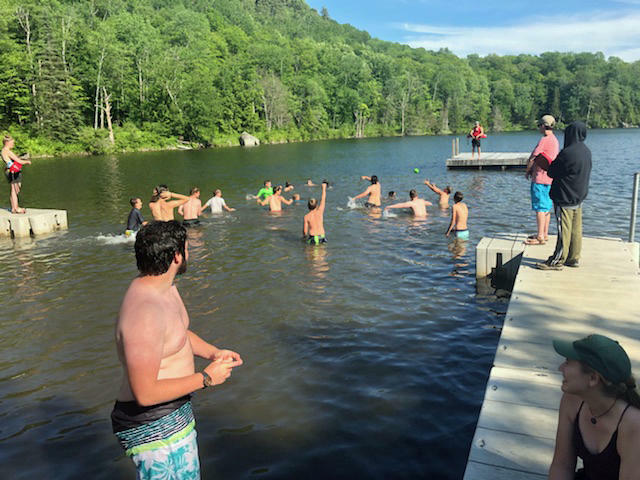 "Just because we have to be professional doesn’t mean that we’re not allowed to have fun," said Joe Franckiewicz, a natural resource instructor at one of the Green Mountain Conservation Camps. "So, whenever I teach this I’m always in there too, and I’m painting myself with mud along with the campers. And I’m catching things and holding them and passing them to kids. So, honestly it’s like being a camper for 11 weeks with just a little more responsibility." There’s no doubt both campers and staff are having fun. But they’re also doing some serious work. 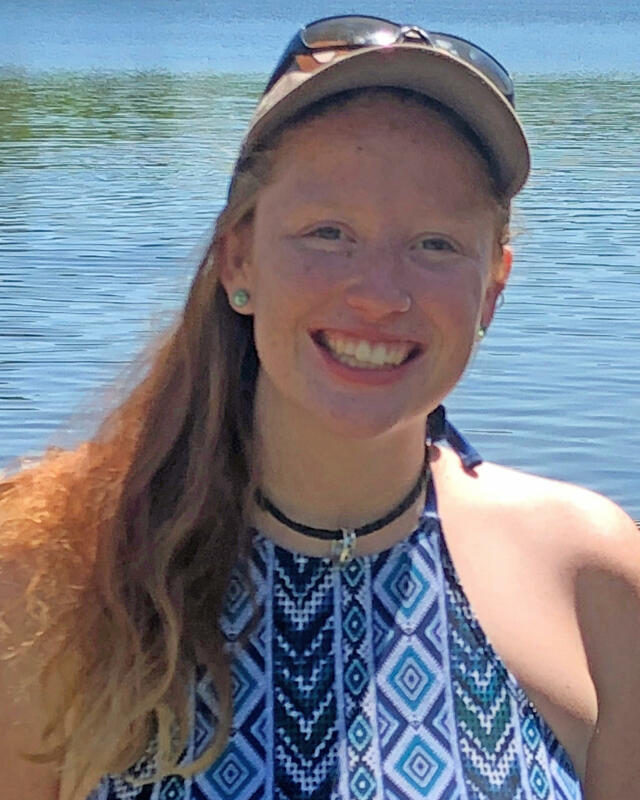 Amanda Preston is director of the Green Mountain Conservation Camp at Buck Lake. "Originally it was run by game wardens and it was kind of, more a military-type camp," she said. "But eventually they realized – it was all volunteer work from the wardens, so they switched it over to kind of college student-aged staff members shortly after that. And ... it’s been really good ever since." “My favorite thing to do is play the keep-away game," he said. "It’s awesome." Because what better way to balance a serious camp curriculum than a good game of keep away between campers and staff? Disclosure: Vermont Department of Fish and Wildlife is a VPR underwriter. The sun was beating down and temperatures had climbed into the 90s as an annual block party in Craftsbury got underway this week. But a thick strip of snow in the backyard of one village home made it — by far — the coolest place in town. While Vermont is running out of room to throw away its trash, not everyone is happy with a proposal to expand the state's only operational landfill.